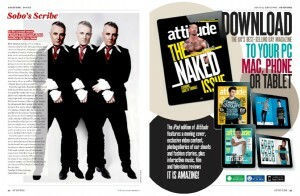 I have an interview and a short story appearing in June’s edition of Attitude Magazine (Issue 219). The story is called ‘Leslie’s Letter.’ It’s about a 76 year old gay man (called Leslie). We live in youth obsessed times. So I wanted to give Attitude something completely different – a story about the type of gay man that is usually excluded from mainstream gay press. I worked hard on this story and I’m pleased with it. It feels like a tiny victory. Attitude’s June edition is in the shops and available to download now.